To support emerging 5G and Internet of Things (IoT) use cases, Communications Service Providers (CoSPs) like China Telecom are gradually replacing their traditional fixed, closed Central Offices (COs) with more agile and flexible Next Generation Central Offices (NGCOs) based on Network Functions Virtualization (NFV) and Software-Defined Networking (SDN) technologies. A critical component of the ...NGCO, NFV-based core network functions running on an edge cloud will bring processing power much closer to the end user, reducing latency and improving the overall customer experience. 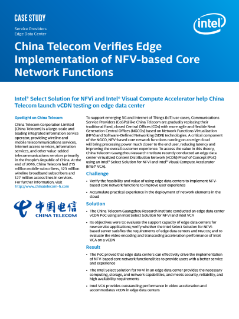 To access the value in this theory, China Telecom Guangzhou Research Institute recently conducted an edge data center virtualized Content Distribution Network (vCDN) Proof of Concept (PoC) using an Intel® Select Solution for NFVi and Intel® Visual Compute Accelerator (Intel® VCA).